Kahlil Felder was an eighth grader in 2009 when Pershing High won the fifth and most recent state championship in the school’s storied basketball history. If the first week of the season is any indication, Felder will play a prominent role in Pershing’s bid to meet its high expectations this season. The Doughboys are ranked the No. 1 team in the state and Felder has been named the Detroit Public School League Proud Strong Learner of the Week after two strong performances in home-court nonleague victories against River Rouge and No. 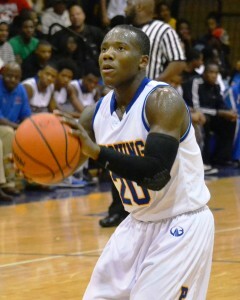 2-ranked Romulus. “It was a team effort in both wins,’’ said Felder, who had 18 points, four assists, eight rebounds and four steals in the 70-58 triumph against River Rouge, and followed that with a game-high 28 points, five assists and seven rebounds to help defeat highly-touted Romulus 83-76. Felder, who has a 3.47 grade point average, is a candidate to be his senior class’ valedictorian, an honor that Pershing’s star player Sherron Dorsey-Walker attained earlier this year before heading to Iowa State. Having already accepted a scholarship to Oakland University, Felder said his focus is on helping Pershing win the city and state championship. The Doughboys last won the PSL crown in 2010 when Felder was a freshman and the team was led by Keith Appling, the state’s Mr. Basketball that year and now a star junior point guard at Michigan State. Felder’s dad Kahlil Sr. once played for the Doughboys and that gives him an even deeper appreciation for the Pershing tradition of basketball success. The tradition began in the 1960s with legendary coach Will Robinson and players such as Spencer Haywood and Ralph Simpson and has continued until the present. Felder says little has changed under first-year coach Wydell Henry, who has taken over the reins from A.W. Canada, who resigned after 10 seasons. Pershing is still synonymous with high school basketball success.